A wedding on the beach in South Carolina is what many people would consider a dream come true: with the surf pounding in the background and the soft sand between your toes, many brides and grooms long for a sweet and simple oceanside ceremony. If you'd like to count yourself among the beach brides and grooms here in South Carolina, you'll need to focus on which beach best meets your needs. The rules and regulations of what you can have at the ceremony site and when you can perform the ceremony vary wildly from place to place, so you'll want to thoroughly check through all of the restrictions before you commit to one place. The appeal: Set just off of the Hilton Head coast, this incredible island is accessible only by private boat or ferry. Naturally, this seclusion appeals to many brides and grooms, who take the extra effort to plan their weddings here. Despite the remoteness of Daufuskie Island, couples will find plenty of options for their nuptials: you can tie the knot under the Bloody Point Lighthouse, at the Freepoint Marina, or at the Haig Point private community. For an intimate affair, you could even rent a beach house or two and have a super casual ceremony right on the deserted beach. The appeal: Edisto Island is wonderfully isolated thanks to its meandering roads and limited commercial business options. There aren't any stoplights, and just one grocery store on an island that attracts mostly South Carolina locals during its busy summer season. Nearby Botany Bay is a beautiful nature reserve, and the small island often sees dolphins and sea turtles off of the shore. Restrictions: The city of Edisto Island has a much more relaxed approach to weddings than many other South Carolina barrier islands. Ceremonies on the beach are permitted, so long as all decorations and chairs are removed by sunset. If you have a wedding under 50 guests and you're planning to close up shop before 10 PM, there's no need to even get permission from the city. However, if you're having a larger wedding or you'd like an exception to the 10 PM noise ordinance, you'll need to fill out the permit application and pay the $30 filing fee at least 45 days before your event. The appeal: Known as the Edge of America, Folly Beach is laid back, eclectic, and always fun, which translates into one memorable place for a wedding! It's a short drive from downtown Charleston, so your guests can enjoy the charm of the Peninsula while also getting a taste of island life. Restrictions: Ceremonies are allowed on the beach proper here, but receptions aren't. Any decorations used in the ceremony must be removed immediately afterwards, and no later than sundown or the tide touches them (whichever comes first). Couples are welcome to set up tents, arches, and pulpits for the ceremony, but these larger items still must adhere to the breakdown time line of decorations. Your wedding cannot interfere with the duties of the lifeguards, nor can it be in the middle of a public access path or beach patrol pathway. Also prohibited are glass containers of any kind, fireworks, tiki torches (or any other open flame) and loud music. Your guests are allowed to throw biodegradable items at the end of your ceremony such as bird seed or flower petals, but rice is a no-no. Weddings cannot use any motorized vehicles at any point (including transport of decorative materials), and all guests must use a public access path unless the couple is renting a beach house directly on the shore. Weddings are not allowed to take place anywhere near the sand dunes (messing with the sand dunes can incur a fine). There's no charge to get married on the beach at Folly, but you will need to apply for a party permit if your entire wedding is made up of more than 25 people. Apply at least 14 days in advance through the City of Folly Beach website. 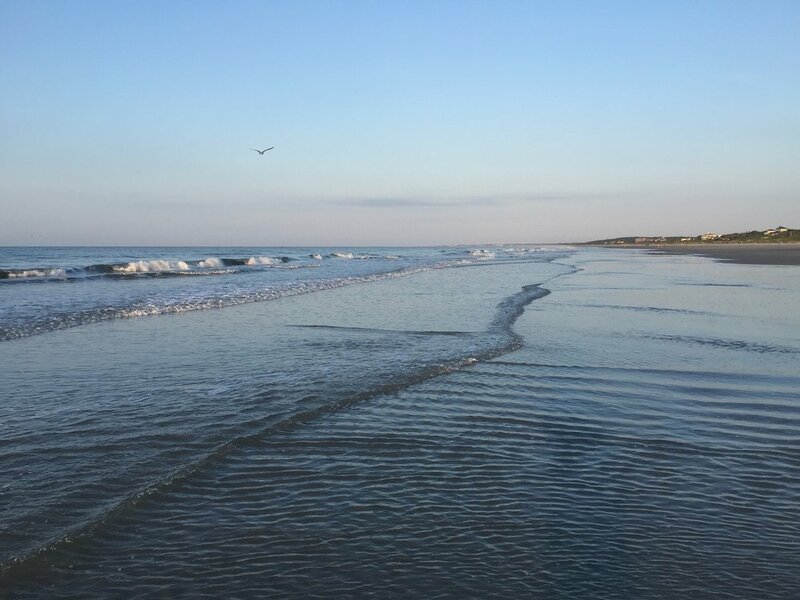 The appeal: Much like Daufuskie Island, Fripp Island is a barrier island off the coast of Hilton Head Island with beautiful beaches, exclusive resorts, and a deep history. Unlike Daufuskie, Fripp Island is accessed by a bridge, which makes it a more appealing option for larger weddings or guests who don't want to be cut off from the mainland completely. There's a large resort that dominates that island, and couples can get married utilizing the Fripp Island Resort's resources from wedding planners to on-site catering. Beach weddings are available, though receptions are not held directly on the sand. Restrictions: Couples getting married on Fripp must adhere to the resort's requirements, including a set number of purchased rental villas and the use of their on-site catering team. Wedding cakes may be brought in. All festivities need to be finished by midnight. The appeal: It's the larger of the two islands next to Mount Pleasant with a cute shopping area and awe-inspiring beach homes. The pier is great for fishing, and you'll see everyone from young families to high school surfers splashing in the water. It's also a quick drive from both Mount Pleasant and downtown Charleston, so your guests can easily explore different areas of coastal South Carolina. Restrictions: Ceremonies are allowed on the beach, but receptions aren't. All ceremony equipment and decor must be moved immediately after the ceremony is finished. In addition, any wedding photographer must have a City business license (when shooting both on and off the beach). No catering is allowed directly on the beach, and your catering team must hold a valid Isle of Palms business license when catering in any island property. Be sure to double check the latest wedding requirements. The appeal: A family friendly and golf destination, Hilton Head Island is a welcoming place for the wedding of your dreams. You and your guests can shop their way around the island before relaxing on one of the many well-kept beaches. It's not far from Savannah, so your guests can also do a day trip to that historic city. Restrictions: Ceremonies are allowed on the beach with the proper permit. The permit must be completed at least 30 days before your event. The appeal: There are several areas along the Grand Strand coast that aren't covered by the restrictions of Myrtle Beach or North Myrtle Beach, and these public beaches are typically less busy than those inside the city limits. These areas include the beaches between North Myrtle Beach and Myrtle Beach city limits, the area between Springmaid Park and Surfside Beach city limits, and south of Surfside Beach to the Georgetown County line. Restrictions: Most weddings within the Horry County public beaches won't need a permit. You will need to file for a special events permit if you're planning on having more than 500 guests, you'll be putting up a tent, or you plan on placing more than 101 chairs out for the ceremony. During the summer, you can have a standing ceremony without any decorations at any time of the day, but if you plan on having a ceremony with less than 100 chairs, you'll have to wait until after 5 P.M. to start. All wedding vendors must have a valid Horry County business permit. The appeal: The Kiawah Island Golf Resort covers the majority barrier island and boasts multiple award-winning golf courses and restaurants. There are miles of bike paths, multiple swimming pools, and a variety of vacation rental options. There's also Beachwalker Park, a popular county park that offers limited facility and stunning views. Restrictions: If you want to get married at the resort, you'll need to work with their on-site planner and catering team. The resort does offer beachfront ceremony options with a variety of locations. To rent the county park for a beach wedding, you'll need to contact Charleston County Parks. The appeal: The City of Myrtle Beach has been a vacation destination for decades, and it has everything from mini golf courses to acclaimed restaurants to an iconic pier. Your guests will have loads of activities and tours to choose from during their visit, and there's more shopping to be than can ever be completed in one visit. Restrictions: Commercially-produced weddings are not permitted on the public beach, but non-commercially produced ones are allowed (no permits necessary). However, there are multiple city parks within commercial areas where both commercial and non-commercial weddings are allowed with the filing of a permit. Things get trickier when you're considering parks in residential areas: non-commercial weddings are allowed but require permitting. It's always best to contact the City of Myrtle Beach if you have any questions about whether you need a permit or not. 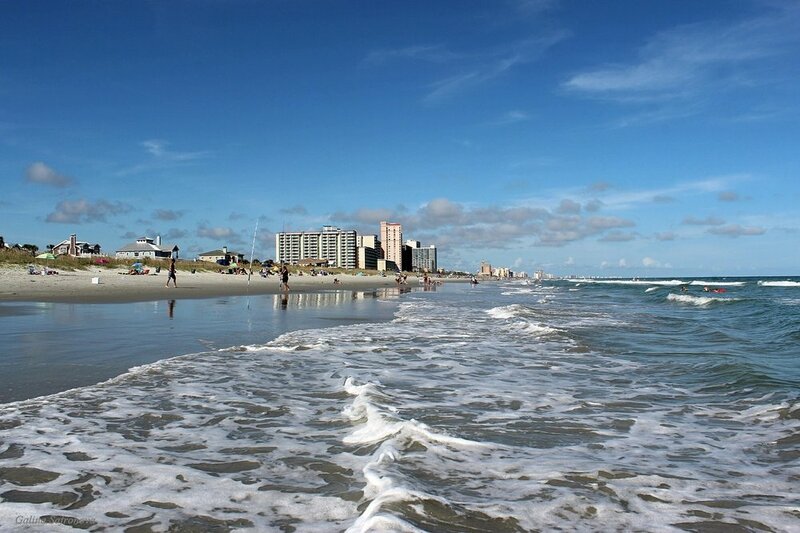 The appeal: Just a few minutes drive from the North Carolina-South Carolina border, the City of North Myrtle Beach has a variety of sightseeing options, hotels, and beaches. 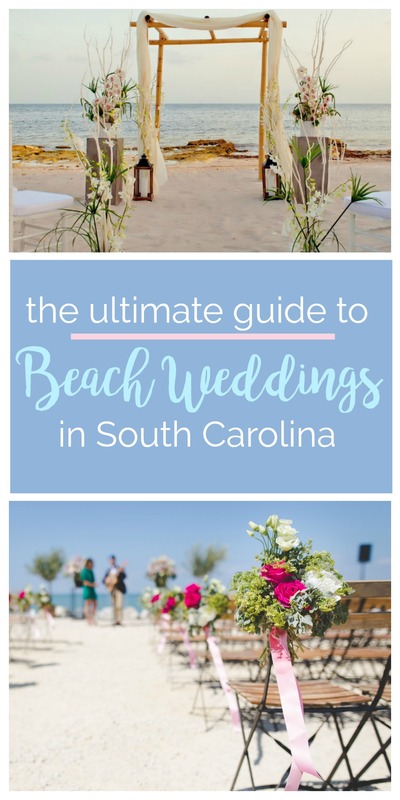 Compared to some of South Carolina's other beaches, it has very few restrictions for weddings, which makes it very popular for elopement and beach weddings. Restrictions: Your guests cannot throw confetti or bring glass containers onto the beach. You and your spouse can select any area along the beach for your ceremony, but you cannot force other beachgoers to move if they're in your selected area, as everyone has equal access to the beach. You don't need a permit for beach weddings. Tents are not allowed, but chairs and arches are (as long as they're removed immediately after the ceremony). See additional suggestions here. The appeal: Located right next to Kiawah Island, Seabrook is another secluded golf resort within driving distance of downtown Charleston. The property boasts multiple golf courses, private beaches, horse trails, and miles of biking trails. Venues include ballrooms overlooking the ocean for a sand-free wedding with beach views, as well as the Ocean Terrace, a paved event space right on the shore. Restrictions: Since Seabrook Island is a privately owned resort, couples seeking to get married here will need to work with the property's planners and catering team. The appeal: Right next door to Isle of Palms, Sullivans Island is the quieter, more low key of the two barrier islands East of the Cooper. There are just a handful of restaurants in the middle of the island, while the majority of Sullivans Island is devoted to private homes and rental properties. Restrictions: No commercial vendors are allowed on the beach--including photographers (so you'd better hope that your Aunt Sally knows her way around a DSLR). Ceremonies must not be held in public walkways or on the dunes. No alters or decorations are allowed on the beach. A wedding permit must be requested in writing; emailed requests will not be honored. The appeal: Called the "Family Beach," Surfside Beach is a quieter option than Myrtle Beach while still boasting the wide, sandy beaches that Horry County is known for. It's also a beautiful area for elopements and smaller weddings thanks to the limited restrictions on beach weddings. Restrictions: As long as the ceremony is within city limits and is a simple one (which the Town of Surfside Beach considers "a bride, groom, and a few friends"), couples are welcome to get married anywhere along the beach. Wedding planners are required to have a valid business license. Couples must fill any holes created from the ceremony, and all items must be removed. Plastic balloons and glasswere aren't allowed. Which of these beach wedding destinations in South Carolina would you love as your ceremony site? P.S. If you want even more venue options, check out our full venues directory.